You might think noodle places are a trend that's sure to come and go, but in Pennsylvania, the noodle trend shows no signs of slowing. From Thai noodle dishes to Japanese ramen and more, these noodle places have covered all the bases. And no matter how you like your noodles, you'll find the best at these 10. 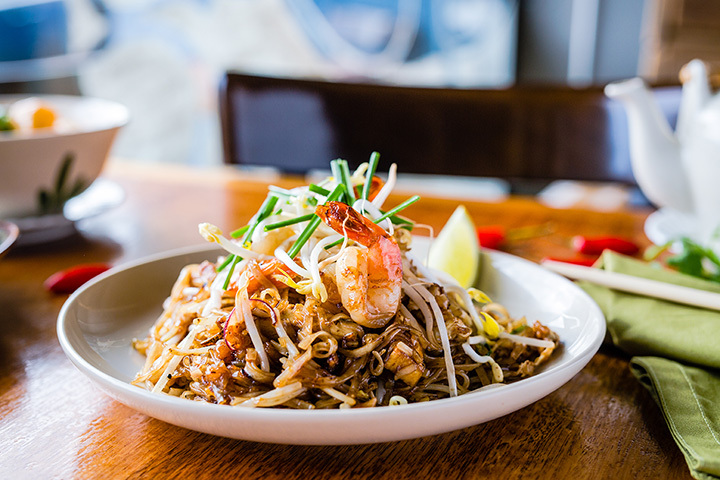 Rice Modern Thai offers many delicious Thai dishes including Pad Thai, Drunken Noodle, and Pineapple Fried Rice, to name a few. You can't go wrong with anything on the menu, but if you asked us what we’d order, it would be the Sober Noodle, Thai Beef Jerky, and Tofu Crunch. And don't forget one of the five varieties of rice! According to its website, Dim Sum & Noodle is Philadelphia's most acclaimed Chinese restaurant. Whether or not that's true, we can't say. We can say, however, that as the restaurant's name suggests, there are a lot of noodle options on the menu. If you're looking to feel spoiled for choice for both dim sum and noodles, you'll want to come here. Eye the menu at Mister Lee's Noodles, and one thing will be startlingly clear: it's small! Fear not, however, as a small menu often means one thing—that each item on it is made with the utmost care. Such is happily the case at Mister Lee's, where ingredients in these made-to-order Japanese inspired ramen dishes are sourced locally at the peak of freshness. We find the Bacon Ramen particularly appealing. If you're looking for a Thai restaurant with some welcome twists on the menu, Siam Restaurant is it. You'll find your favorite noodle dishes here, but you'll also find intriguing dishes like crab fried rice, pineapple yellow curry, and a Thai tea cake we're practically dying to try. Issei Noodle has a little bit of everything. At this Lancaster noodle restaurant, you'll find Thai dishes, Vietnamese pho noodle soup, ramen, udon, and a whole lot more. Stop by to meet your noodle needs today. If there's one thing that's evident in each of the dishes served at Terakawa Ramen, it's the chefs' passion. You can taste it in the broth that's simmered for two days, the handmade, perfectly al dente egg noodles, and the fresh ingredients topping each tasty bowl of ramen. Of course, there are other items on the menu, but when the restaurant has "ramen" in its name, why on Earth would you order anything but? If Vietnamese noodle dishes and soups offer your favorite flavors, Rice & Noodles should be at the top of your list. Choose from pho noodle soups, steamed noodles, steamed Vermicelli noodle patties, stir-fried entrees featuring your choice of noodles or rice, or another classic Vietnamese dish like fried egg rolls. Whatever you decide, you won't be disappointed. Nooddi Thai Chef prides itself on its diverse menu, quality food and service in an atmosphere everyone can enjoy. To cure your cravings for Thai food, stop by one of its two locations. While Noodle Eighty Eight serves up a lot more to Souderton area residents than just noodles, they're what this restaurant does best. No matter what noodle dish you decide on, don't leave without trying the Peking duck. You can thank us later. Pittsburgh's Noodlehead may not take credit cards or reservations, but it does take inspiration from the diverse street markets of Thailand which is apparent when you see the menu. Featuring both traditional Thai noodle dishes and more modern takes, there's no way to go wrong here—but we'd recommend trying the "street" noodles.